There is nothing more delicious on a chilly day than this slow cooker tomato soup! 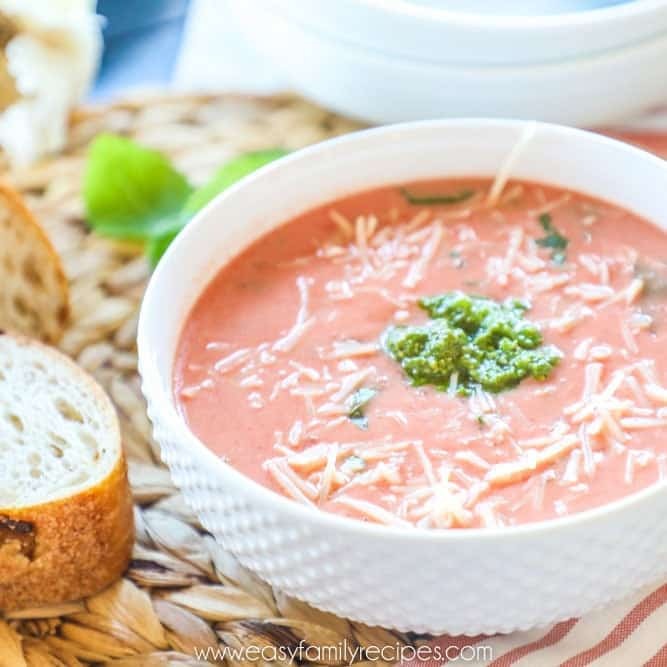 This creamy tomato basil soup is so tasty, that you won’t believe how easy it is to make using a Crock Pot and a few simple ingredients. Let the slow cooker do the work bring out the flavors of the tomato and basil while it cooks away all day and have it ready to eat at dinner time. The leftovers can be reheated or frozen for lunch or dinner another day. There is probably no one recipe I personally eat more often than Tomato Basil Soup. 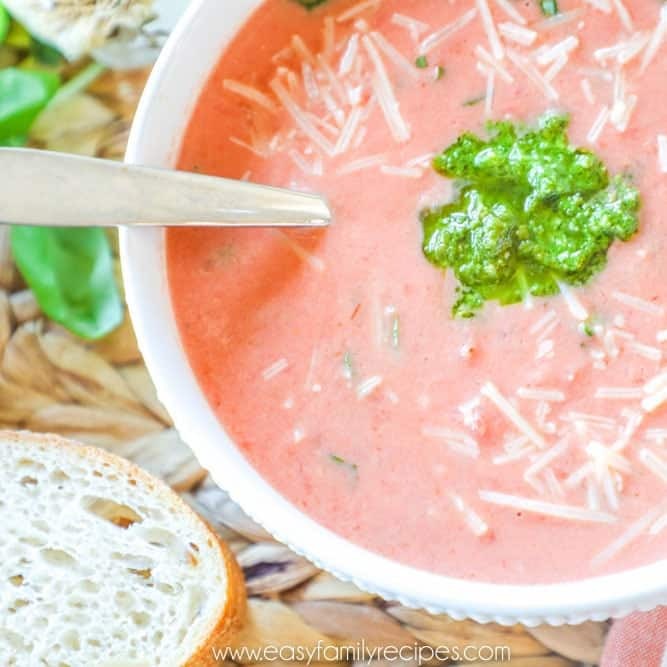 It is literally so good that every time I make it, and I have made it hundreds of times, I think “I forgot just how delicious this is!” It is creamy, comforting, just a hint sweet, and everything I think tomato basil soup should be. The absolute best part is, however, how insanely easy it is to make. I mean it is stupid easy! Usually, when I make it to share, people immediately ask for the recipe and when they see it they can’t believe how simple it is. If you love simple recipes as much as me, please take a minute to sign up for my Hungry E-mail Club! I send out a weekly email with all new easy recipe inspiration for the week. It is free and you can sign up here! 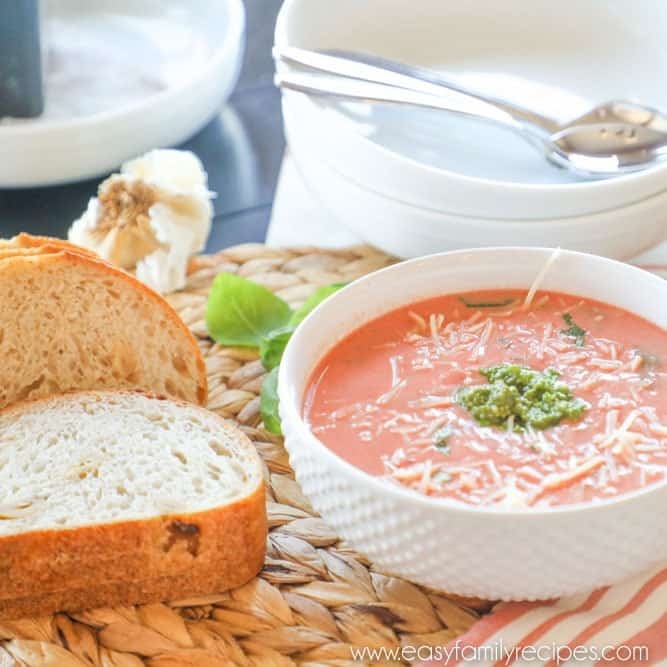 I created the original Tomato Basil Soup recipe for the stove top, but since it was so popular with not only me but so many of my readers, I have adapted as both an Instant Pot Tomato Soup recipe, and now I am sharing a Slow Cooker Tomato Soup version below. All three of these recipes taste pretty much identical, it just gives you options depending on how much time you have and what you like to cook with. 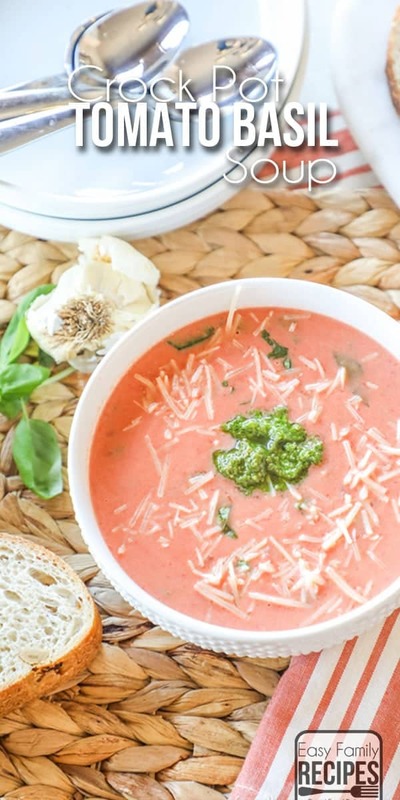 All three tomato soups are simple and delicious. You can use your imagination to come up with other tasty combinations as well. I also love serving it with garlic toast or cheesy bread sticks as a meal. To make this recipe follow along here where I will go step by step for what ingredients you need and tips and tricks for how I make the soup. The recipe is pretty straight forward, but if questions arise I most likely will cover them here. Please feel free to leave a comment if you still have questions. If you just want the quick version of the slow cooker tomato soup, feel free to scroll down to the bottom of the post to find the recipe card. 1 28 oz can crushed tomatoes- You can also use 2 14.5 oz cans if you have them on hand. The extra ounce won’t be a problem. Also, I recommend using the best brand you can find. The quality of the tomatoes will directly effect the taste of the soup, so if you are going to splurge, the tomatoes are where to do it! 1 28 oz can diced tomatoes- Again, feel free to use 2 smaller cans in place of one large one. The big thing here is that I prefer my soup with chunks of tomatoes in it. If you like smooth tomato soup, you can do one of two things. The easiest is to just use additional crushed tomatoes here in place of the diced. If you make it with the crushed and diced tomatoes, you can use a stick blender to make it smooth at the end as an alternative. 1 tbsp crushed garlic- You can use fresh garlic, but for the easy factor, I like to use the Garden Gourmet brand tube you can get in the refrigerated produce section at the grocery store. 1 14 oz can of chicken broth, or 2 cups – fresh chicken brothI use I make from the leftovers of rotisserie chicken when I have it, but if not a can or two cups from a carton will do the trick. 2 Tbsp sugar- This cuts the acidity of the tomatoes and gives it just a hint of sweetness. 1 cup heavy cream- Heavy cream works best in this recipe, however, if you want to lighten it up, you can use half and half in place of it. The soup won’t thicken quite as much and the half and half doesn’t always blend as well, but the taste will still be good! 15-20 basil leaves -OR- 1 Tbsp dried basil leaves- Fresh basil is always my preference for this soup, however since soup weather usually starts when the prime season for fresh herbs ends, so I like to give the option because dried basil will also work. Make sure and note that the basil is added to the recipe in different places depending on whether you are using fresh or dried basil. Pour the tomatoes, broth, and garlic into the crockpot. If you are using dried basil, also add it now. If you are using fresh basil you will wait until step 3. Then close the lid and set the temperature to low and the time to 4-6 hours depending on when you will be ready to prepare and serve it. At this step it can basically cook as long as you want it to between 2-4 hours and be very tasty. As long as you keep the lid on the crock pot so that moisture doesn’t escape, you can let the flavors continue to simmer in there until you are ready to get dinner on the table. After cooking, open the lid and first stir in the sugar, next stir in the butter, then continue to stir until both are melted and well combined. This should just take a minute or two but it helps to get this completely combined before adding the milk. Next stir continuously while pouring in the heavy cream very slowly. Continue to mix until it is incorporated throughout. If you are using fresh basil stir in the basil now. The most important thing here is that you pour slowly and mix continuously. If you pour too much cream at a time it can have a chance to curdle before it is combined which won’t give you the smooth creamy texture you are looking for. By continuously stirring small amounts you will be able to get it all combined without the milk heating up too much. Serve hot, topped with a dollop of pesto, croutons and a sprinkle of parmesan cheese. This should make about 6 bowls of soup. It will serve more if they are smaller servings or less if you do extra large servings of course! Be warned though, this stuff is addictive, so while you can refrigerate it or freeze it for later, you might not have any left to save! I really hope you find yourself eating this recipe as much as I do when the weather gets chilly! If you get a chance to make it, I would love it if you would take a moment to leave me a note. It just makes my day to know people are making my recipes. Or snap a photo and tag me on Instagram @easyfamilyrecipes so I can see what you are cooking! And before you go… don’t forget to sign up for my Hungry Email Club for more easy recipes! 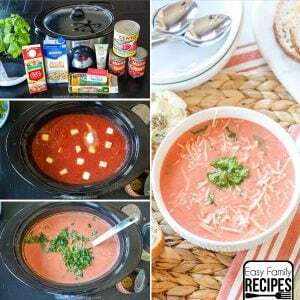 A creamy tomato basil soup recipe made in the slow cooker. This soup is perfect for cold days and can be refrigerated or frozen to make a quick meal on a busy day. Pour the tomatoes, broth, and garlic into the crock pot. If you are using dried basil, also add it now. Then close the lid and set the temperature to low and the time to 4-6 hours depending on when you will be ready to prepare and serve it. After cooking, open the lid and first stir in the sugar, then stir in the butter, and continue to stir until melted and well combined. The soup can be stored in an airtight container in the refrigerator and reheated for 3-4 days. You can also freeze the tomato basil soup and reheat in the microwave, or on low on the stove top. How would you convert this to stovetop if you don’t have time to slow cook it?! This recipe is delicious and very easy to make. It goes great with grilled cheese sandwiches. My wife and I both love this soup. It is perfect for a cold winter day.